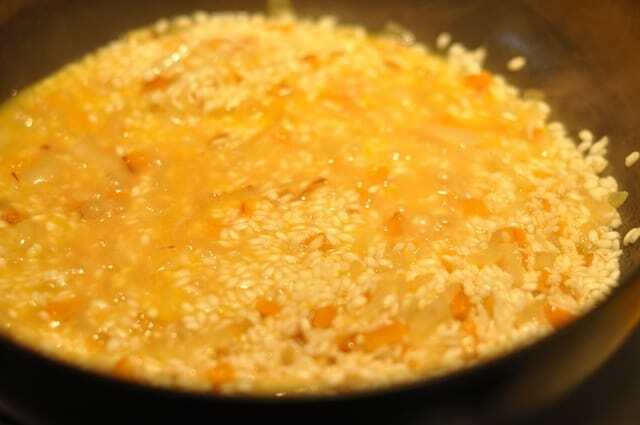 Butternut squash risotto for me was inspired by a couple of blogs that I like to visit. I recently saw a post on making risotto, and thought, man it had been a long time since I have made any, and it is the season of butternut squash, or at least it is in Texas. Guess what, I was a little over ambitious during my last trip to the farmers market. If you have never made risotto before, it may be because you heard it was difficult or really labor intensive. It isn’t difficult, but this is a dish where you do need to be actively watching and sometimes stirring the pan that you cook your rice in. What’s the payoff? You will get a wonderfully creamy rice dish, that can be served as a main dish or an appetizer. I recently went to D’Marco’s in Houston and had the most wonderful risotto dish. I thought man, why am I not making this more often at home? Guess, what, I am going to walk you through making risotto, and I am not even going to charge you the 18 dollars that I paid for a plate of delicious risotto. Before I start, I want to say, if you have leftover bits of sausage, chicken, smoked meat, consider adding that to this risotto. Leftover vegetables could be added towards the end of the cooking process if they are already cooked. 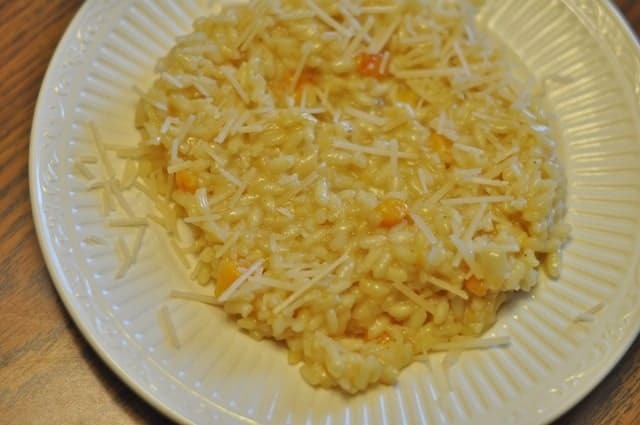 Risotto is a forgiving dish that really lends itself to modifying the original recipe. 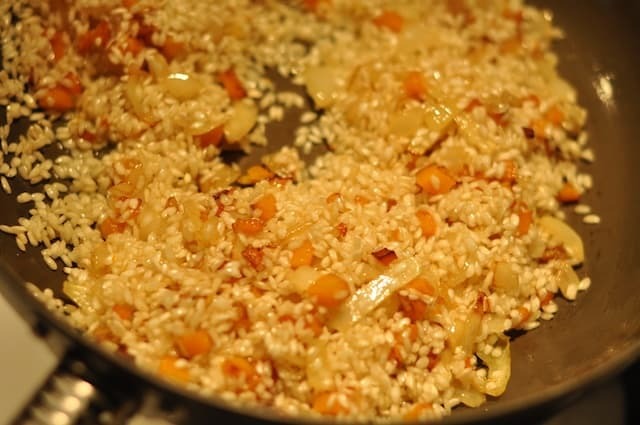 You can use medium grain rice instead of arborio. Arborio is more expensive and can be harder to find in some grocery stores. Minute rice will definitely not work as a substitute, and long grained rice like jasmine won’t give you the nice creamy richness that arborio rice will. Yield: 8 appetizer servings, or 6 entree servings. 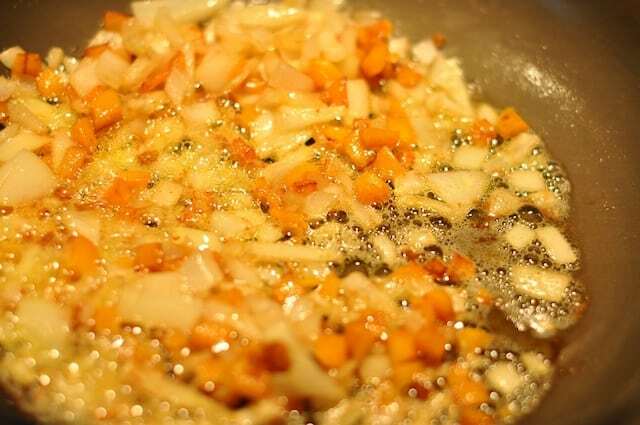 You are going to fall in love with this butternut squash risotto. Heat up chicken stock into a large pan, and add saffron strands. You want to heat the saffron and the chicken stock together so you get the flavor from the saffron. Saute butternut squash in a large saucepan for a couple of minutes, it will begin to brown, when the squash begins to brown, add the diced onion to the saucepan. When the onions have become translucent add the rice, and stir to coat the rice with the butter until all of the rice is shiny, and the rice turns white and chalky. Add one cup of broth at a time until the broth is soaked into the rice. Continue doing so, this should take about 20 to 25 minutes until all of the stock and wine, if used is incorporated. When all of the stock is incorporated the mixture should be creamy, add cheese, and stir to incorporate, taste rice, and adjust seasoning with salt and pepper. Parmesan cheese tends to be a little salty so don't check for seasoning until the dish almost completed. Let risotto rest for a couple of minutes before serving. Are you SURE, 10 CUPS of stock PLUS wine ? If I am making plain old rice it is always 1 cup rice, 2 cups liquid. This is how I made my dish, and the actual dish is pictured, it was quite a bit thicker than soup. I personally really love a plate of thick creamy risotto.